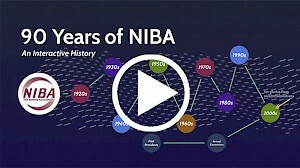 As part of its 90-year celebration in 2018, NIBA developed an interactive history presentation. Click the image below to view. For its 80th celebration in 2008, NIBA created a printed history brochure. NIBA hosted the first ever Joint Industry Summit along with PTDA (Power Transmission Distributors Association). The association moved their headquarters to Milwaukee, Wisconsin. NIBA changes their name to NIBA - The Belting Association to reflect the increasingly global nature of the industry and the association. The association launches their first edition of the website. NIBA moved headquarters to Waukesha, Wisconsin. The association opened a new category of membership opened for international members. NIBA commences their college scholarship program for students in industrial distribution programs. This scholarship program fund has initiated several scholarship programs that continue to award scholarships yearly. “Conference booths” are created at the national meeting to improve communication between distributors and manufacturing representatives. This concept significantly reduced inter-organization conflict. On September 17, 1973, NILA directors upon petition form its Flat Belt Drive Division opened its membership rolls to fabricators and/or slitters of industrial belting of all types. Name of Leather Belting Division of the Association was changed to Flat Belt Drive Division. On January 18, 1954, through its legal representative, petitioned the New York Secretary of State to change its name to the National Industrial Leather Association. This petition was granted and the organization then became the National Industrial Leather Association Incorporated. This change was made for the reason that the Association now represented not only the manufacturers of leather belting but also manufacturers of mechanical leathers, leather packings, and textile leathers. On June 4, 1954, the Internal Revenue Service extended income tax exemption to the National Industrial Leather Association Incorporated. The association established its own headquarters at 41 Park Row, New York and Mr. Rath among others, became an employee of the association. Manufacturers of textile leathers applied for membership in the Association which resulted in the recognition of the Textile Leather Division of the Association. Manufacturers of mechanical leather packings were accepted into the membership of the Association under the name of Mechanical Leather Packing Division. Income tax exemption granted to the Association on August 28, 1942. American Leather Belting Association moved into the office of the Power Transmission Council at 63 Park Row, New York, and E. R. Rath of PTC was assigned to ALBA as its Executive Secretary. An extensive advertising program covering leather belting was contemplated and put into effect. Association incorporated under the laws of the State of New York with the name American Leather Belting Association.